While family lawyers were sleeping, two bullets were dodged. Or, more accurately, one bullet was dodged and one deflected for the time being. Last week, I summarized the family law portions of the recent Supreme Court decision in Tensfeldt v. Haberman, 2007AP001638 (July 14, 2009). This article will take a critical look at its implications — and the harm which was averted. In the case, Robert Tensfeldt entered into a marital settlement agreement that provided, in relevant part, that Robert would execute a will leaving two-thirds of his net estate to his three children from that marriage. After Robert remarried, he executed new wills that ignored this portion of the divorce judgment. When Robert died, the children commenced a probate action in Florida to enforce their rights under the terms of the divorce judgment. Probate litigation ensued in Florida and later, a Wisconsin lawsuit against the attorneys and the law firm that drafted the wills. Among other defenses, the attorneys and their law firm argued that the marital settlement was unenforceable and that the statute of limitations regarding judgments applied. The Wisconsin Supreme Court, in a 4-2 decision written by Justice Ann Walsh Bradley, held that the divorce judgment requiring Robert to create a will in favor of his children was enforceable because the divorce court had authority to incorporate a stipulation for property distribution to children. The Supreme Court recognized longstanding law that even where a court does not have the authority to impose a certain order, the parties may voluntarily stipulate to do so and the court can incorporate their voluntary stipulation into its judgment. Therefore, Robert was obligated to follow the court’s judgment unless it was modified in a proceeding in the circuit court or on appeal. The court dodged the specific issue of whether the 20-year statute of limitations on judgements bars the tort claim, finding that it did not need to decide this issue since the alleged tortious conduct occurred between 1980 and 1992 — within 20 years of Robert’s death in 2000. Curiously, the ethical issue warranted only a footnote in the opinion, where the court cited SCR 20:1.2(d)(2008), which prohibits a lawyer from counseling or assisting a client in conduct that the lawyer knows is fraudulent. The first estate-planning attorney, Roy C. La Budde, knew the requirements of the divorce judgment; yet, he drafted a will, intended to be submitted to probate, which ignored the judgement. As officers of the court, don’t we lawyers have a duty to require our clients to comply with court orders? Nonetheless, La Budde gave his client three options, allowing him to choose the option violating a court order. One would think more outrage from the court would be warranted at an attorney even offering such an option. In regard to the family law issues, limitations on the court’s powers to approve stipulations would have wrecked havoc on settlement negotiations, had Justice Bradley’s opinion not prevailed (With all due respect, what were the two dissenters, Justices Patience D. Roggensack and Annette Kingsland Ziegler, thinking?). To hold that a trial court’s power to approve stipulations is limited to orders specifically authorized by statute would have tied the hands of divorcing parties. Maintenance buy-outs and Section 71 payments, among other negotiating tools, would have become relics of the past. 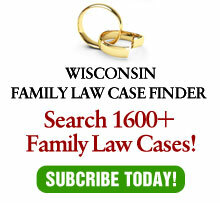 In recent years, Wisconsin courts have eliminated the ability of parents to avoid litigation over future child support — holdings criticized in this column for, among other reasons, not allowing two rational, informed citizens to voluntarily contract their own affairs. At least this restriction on liberty might be rationalized as one designed to protect children (although it can be argued that its effect is the direct opposite). But how does one rationalize such restrictions on liberty when no minor children are involved? Fortunately, the majority recognized the importance of freedom and upheld a line of Wisconsin cases in conformity with allowing knowing parties to voluntarily negotiate their own affairs. Given the importance of the issue, one has to wonder why no amicus briefs were filed in this case by either the State Bar of Wisconsin Family Law Section or the American Academy of Matrimonial Lawyers. Hello there? Anyone awake? The second bullet, regarding the statute of limitations on judgements was diverted for the time being. Fortunately, unlike the first issue, family law cases involving an issue regarding the 20-years statute of limitations on judgments do not arise with great frequency. So, although the Supreme Court did not specifically reach that issue, it can be assumed that by not doing so — and with the footnote in the opinion quoted above — family law is safe from this problem for the forseeable future. So, a bullet dodged and one averted for the time being is a pretty satisfactory outcome. Even if it was achieved while family law attorneys — and the organizations which are supposed to serve them — weren’t paying attention.